Recorded at Century Sound Studios, New York. After some what would prove to be somewhat typical legal wrangling and general bad feeling with Bang Records regarding the rights to most of Van Morrison’s back catalogue thus far, or something like that (too complicated to bother with now), an album was finally recorded. 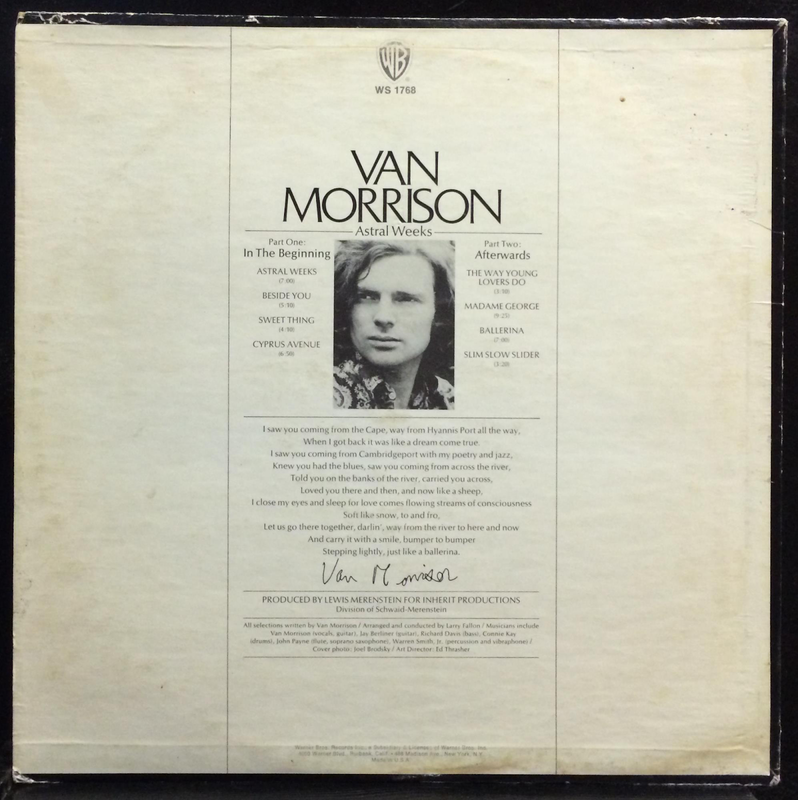 Morrison was now, in 1968, moving clearly away from the fast-paced rhythm and blues that had characterised his output while part of the beat group, Them, and some of his solo recordings from 1967. Rather than going “psychedelic” like so many other groups and artists, Morrison was starting out on a long journey into self-awareness, spirituality and mysticism that would dominate so many of his recordings for many years to come. He was now inspired and motivated by poetry, philosophy, the arts, the countryside and the great works of literature. Musically, his love of jazz, folk and soul would come to the forefront and he would develop a new style of vocal that often involved repetition of single refrains many times - “just a like a, just a like a, just a like a, just a like a, just a like a, like a ballerina...” or however many times he repeated it. It could, in my opinion, get irritating at times, but it was certainly unique and gave his vocals a real recognisability. Lyrically, that good old chestnut, “streams of consciousness” always rears its head when “Astral Weeks” is discussed, and, it has to be said that a lot of the lyrics have no obvious meaning or point of connection. They just express a series of feelings, images and characters. A good example is my personal favourite track, and one of Morrison’s finest of all time - the intriguing, perplexing “Madame George”. Just what was it all about? Does it really matter? It just has a great feel - slowly brooding, a wonderful jazz/soul backing and Morrison’s mystifying lyrics. Every bit of it is sensational. When Morrison first sings “down Cyprus Avenue..” it still sends tingles down the spine. I also love the percussion and flute fade out. Just eight minutes of soulful redemption. Incidentally, Marianne Faithfull did an absolutely stirring, evocative version too. The album was recorded by jazz session musicians not previously known to Morrison, or familiar with his music. They were in a studio and Morrison was in a booth with his acoustic guitar. Nevertheless it worked to a tee. The instrumentation is fantastic throughout. To this day, apparently, the identity of the flautist remains unknown. 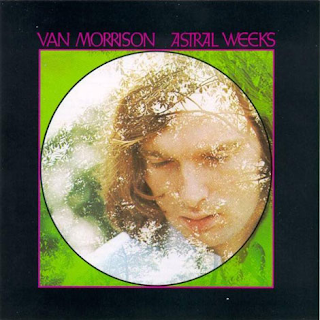 The beautifully rhythmic acoustic flourishes of the title track kick things off and Morrison’s plaintive,soulful voice joins in, expressing lyrics about “slipstreams”, “viaducts” and “dreams”. A read a review which said at this point, Morrison was up there with Dylan. They were right. This is Morrison’s “Blonde On Blonde”, for sure. This was still 1968, remember. This was “pop” music as it hadn’t really previously existed. The song’s several minutes just wash over you as if you are lying in a warm bath. “Beside You” starts with some beautiful crystal clear acoustic guitar and a cutting, slightly too-loud vocal from Morrison. It is one of his first overtly spiritual songs. The guitar, flute and the almost ad-hoc vocal intertwine most effectively. The same applies to the mystical, swirling “Sweet Thing” with Morrison at his pastoral, bucolic best, speaking of “gardens wet with rain” (an image he would revisit on 1986’s “In The Garden”). Over an insistent shuffling bass and percussion backing, Morrison and the musicians push the song onwards and upwards to a kind of creative nirvana. That voice and that fluttering flute and sweeping strings. One of his best songs of all time. All romantic positivity and sensitivity (that such a notoriously “difficult” man could be so tender, lyrically, has always fascinated me). The melodic bass introduces us, with a lovely harpsichord refrain underpinning it, to the wonderful “Cyprus Avenue”. Morrison gets all nostalgic about a street from his youth and some stunning violin joins in. Yet another magnificent track. Morrison is in complete control here, despite being in another room. What is strange is that on all the many Van Morrison compilations over the years, only “Sweet Thing” from this sensational album is ever included. Why not “Astral Weeks”, “Cyprus Avenue” or “Madame George”. The beauty of digital programming, of course, is that they can be added. “The Way That Young Lovers Do” is a jaunty, brass-driven, jazzy short sharp piece of fun that many feel is incongruous in the context of the album. I disagree. It livens things up a little. Don’t worry. “Madame George” is coming. I remember hearing Robert Elms introducing it on radio once and he simply said “this is a mighty, mighty record”. He was right. I can’t listen to it without getting all watery-eyed. Those cymbals at the end and Morrison vocalising us out, on that train. Just heavenly. Morrison repeats “in the back street” quite a bit on “Madame George”. Maybe there was something in his “Bruce Springsteen stole some of my lines” claim after all. “Ballerina” seems almost “live”, as if they just improvised on the spot, which, apparently is something close to the truth. The beat remains ever insistent - acoustic rhythm, bass, percussion. Just intoxicating. It sounds great in the latest 2015 remaster. As indeed does all the album. Van sings as he did on “It’s Too Late To Stop Now”, in total control, yet sounding so spur of the moment. In some ways, parts of this are the best bits on the album. “Slim Slow Slider” is the most mournful song on the album, its repeated blues-style vocals tell of a girl’s tragic demise. It is, for me, the only song that does not have any uplifting, inspirational qualities. There is always that feeling of hope, of spiritual redemption in the other tracks. Not in this one. It comes to an abrupt end. Somehow I feel this magnificent piece of work should have faded out gracefully, not with a slamming of a door. Never mind though. It has been one hell of a journey. PS - the extras include some “alternate takes”. The “Madame George” is enjoyable but I prefer the original. “Ballerina”, however, is excellent, with some big, booming saxophone parts. “Slim Slow Slider” is great too, bassier, I think, with some nice clarinet(? ).